"Red Barn in Lancaster PA"
This one I did from a ref photo taken at Lancaster Pennsylvania in spring. Although I paint this one from a photo, but I kept my approach similar to plein air. I know I still have a quite journey before I can reach the quality I want for my landscapes, but if I keep on doing this kind of small studies. I will be closer to my goal gradually. 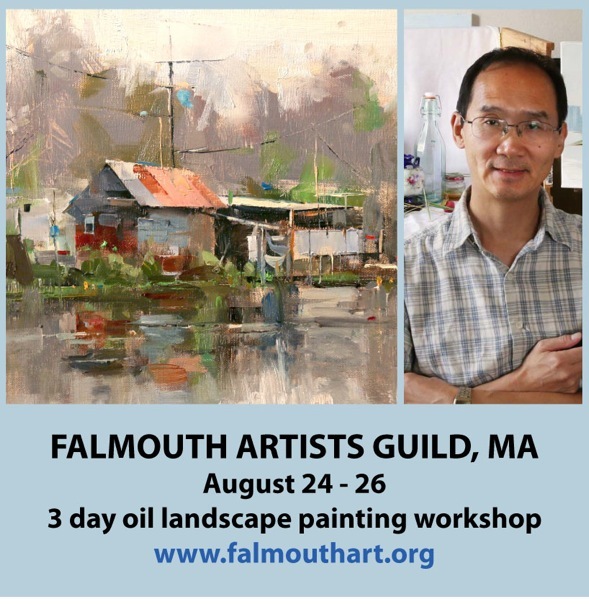 From August 24 to 26 I will go to Cape Cod in Massachusetts and teach a 3-day workshop at Falmouth Artists Guild. Different from most of my oil painting workshops, I will concentrate on landscape painting specifically on this one. It will be a perfect time to paint out doors in New England at this time of the year. We still have a few openings. 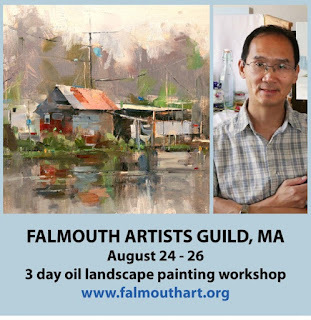 If you are interested in my painting process, please check the workshop description at Falmouth Artists Guild Website and sign up. Thanks. 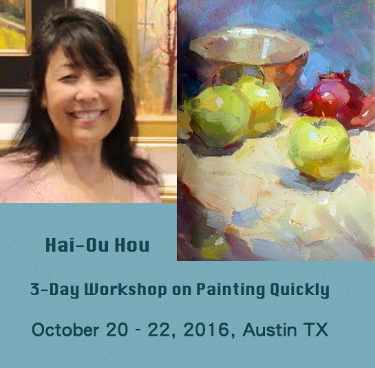 I went to plein air painting last Saturday with a group of Austin artists. The day was hot, but I picked up a shaded spot. So it wasn't too bad. The building in the painting is an old Texaco gas station. I didn't think it was open. However the traffic on the road was quite busy. There is well known Texas BBQ restaurant nearby. Most of the people must be going there.